Where can I get the join instructions when I am attending a Chime meeting? I want to send the information to a colleague so they can join. While attending a meeting, meeting instructions are available to attendees joining with a Chime desktop or web application. 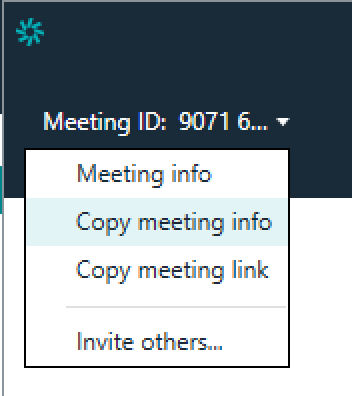 When using the Chime desktop application, the meeting instructions can be found by clicking on the meeting ID in the upper left of the meeting window. 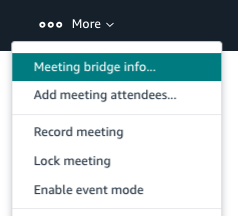 When using the Chime web application, the meeting instructions may be found my choosing Meeting bridge info... under the More menu. Another useful place to get the meeting instructions may be the information sent in your calendar invite.